The rate of atopic dermatitis in the general population has increased in the recent years. Symptoms of atopic dermatitis include severe itching, which can often affect a person’s sleep and consequently their quality of life, and even causes some people to become so discouraged that they lose faith that their condition can ever be resolved. In Chinese medicine, strong emphasis is placed on the differentiation of patterns as a prerequisite to determining treatment. Time tested advice says that the so-called branch should be treated in acute situations, while treatment of the root or the treatment of the root and branch together is appropriate in chronic illnesses. The goal in Chinese medicine is to regulate the functioning of the body, including the zang fu organs, in order to treat the root cause of the disease. 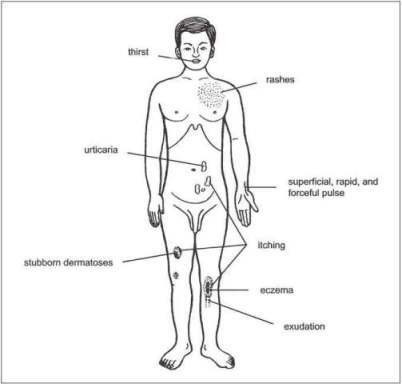 The primary cause of atopic dermatitis is congenital Spleen deficiency, which creates a susceptibility to contracting wind, damp and heat pathogens that, while contending with the upright Qi in the skin, lead to symptoms. From the perspective of Chinese medicine, a person with a congenitally weak constitution and a Spleen that is unable to transform and move food essence will be more likely to develop internal dampness. Such a condition is the underlying factor for outbreaks of symptoms on the skin. Thereafter, lack of discretion in the diet, such as eating foods said to induce outbreaks such as certain seafood, dairy, eggs or acrid foods, can cause dampness to transform into heat and push the dampness and heat (that has accumulated internally) outward where it erupts in the muscles and skin layers. Other inducing factors include external wind, dampness, and heat pathogens that combine with internal dampness and gradually erupt in the muscle and skin layers. Wind-damp pathogens invading from the external environment create congestion in the muscles and skin, as well as contend with Qi and blood causing them to bind. This results in irregular zang-fu functioning, as well as preventing the defense Qi from diffusing and venting outward. The end result is water/dampness that cannot be transformed properly and skin that cannot be properly nourished by Qi and blood. Biomedicine is not completely clear as to the causes of atopic dermatitis or to what pathomechanisms are involved. However, symptoms of atopy are generally considered to be the result of immune response mediators and such reactions have both hereditary and environmental factors (including allergens such as dust, foods, pollen, and contact with irritants). 1. This type of pattern is seen in well-developed, overweight children. 2. Most patterns include blood-heat and Spleen dampness invading the skin. 3. Symptoms include redness of the cheeks and generalized flushing of the skin. Eruptions tend to arise rapidly and form millet-sized papules that if broken, exude yellowish discharge that dries into a crust. The skin also becomes red, and pruritis can be severe. Weeping of the skin due to scratching the affected areas and the appearance of vesicles is usually seen on the lateral side of patient’s body. Other symptoms include dry stools, urine that is more yellow than normal, a red tongue with a thin yellow, or greasy yellow coating and a slippery and rapid pulse. 4. During an acute phase, treatment should include clearing heat, eliminating dampness, coursing wind and relieving itchiness. Formula: Modified Xiao Feng Dao Chi San: Schizonepeta (Jing Jie), Saposhnikovia (Fang Feng), Arctium (Niu Bang Zi), Scute (Huang Qin), Kochia (Di Fu Zi), Raw Rehmannia (Sheng Di Huang), Oldenlandia (Bai Hua She She Cao), Sophora Root (Ku Shen Gen), Atractylodes (Cang Zhu), Licorice (Gan Cao). Clinical modifications: Damp-heat: add Six to One Powder (Liu Yi San), Coix (Yi Yi Ren); For extreme heat: add Forsythia Fruit (Lian Qiao), Isatis Leaf (Da Qing Ye) and Gypsum (Shi Gao). 5. Damp-heat with toxin accumulation is an acute pattern, with rashes appearing on the neck, back, and lower parts of the legs, particularly around the popliteal crease. Signs include burning heat on areas of the rash, erythema, and vesicles with wet, dripping exudate. Severe cases include erosion, infiltration, secretions, pus and severe pruritis. Patients often have a bitter taste and a greasy or sticky feeling in the mouth, as well as vexation, scant urination that may be reddish brown in color, sloppy stools or constipation, a tongue that is red with a yellow greasy coating and a rapid slippery or moist slippery pulse. Treatment: Eliminate dampness, clear heat, cool blood and resolve toxins. Formula: Modified Dioscorea Hypoglauca Decoction to Eliminate Dampness (Bi Xie Shen Shi Tang): Tokoro (Bi Xie), Coix (Yi Yi Ren), Scute (Huang Qin), Phellodendron (Huang Bo), Atractylodes (Cang Zhu), Moutan (Mu Dan Pi), Raw Rehmannia (Sheng Di Huang), Scrophularia (Xuan Shen), Earthworm (Di Long), Kochia (Di Fu Zi), Smilax (Tu Fu Ling), Black Striped Snake (Wu Shao She), Tribulus (Ji Li) and Licorice (Gan Cao). Treatment: Clear heat, eliminate dampness and arrest itching, with assistance from herbs that fortify the Spleen and expel wind.